MBABANE, Jan 7 2014 (IPS) - Smiling as she breastfeeds her six-week-old baby boy, Lindiwe Dlamini, 38, is optimistic about his future. Dlamini, who is HIV-positive, is determined that her baby will not be infected. 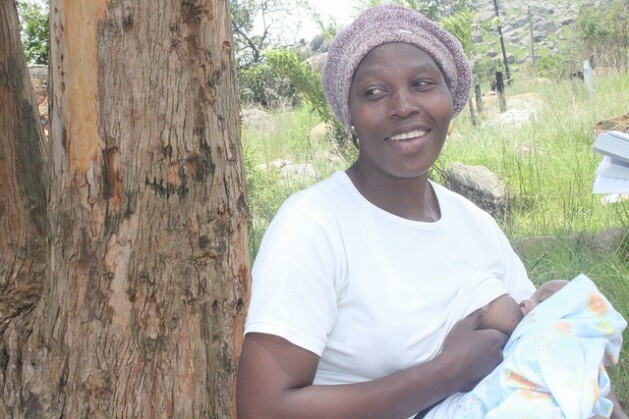 The mother of three – who conceived her first two children when she was HIV-negative – was on antiretroviral therapy (ART) when she delivered a healthy boy in November. Now she is feeding him on breast milk and nothing else for six months – advice she received during antenatal care. She knows mother’s milk is more nutritious and carries antibodies. “Breastfeeding is the most affordable method for me because I’m unemployed, but I wasn’t so sure considering my status,” Dlamini told IPS. Half of all new episodes of HIV transmission to children occur during breastfeeding if mothers are not on ART, says the Joint United Nations Programme on AIDS (UNAIDS). Alarmingly, although Swaziland recorded a 38-percent decline in new HIV infections among children between 2009-2012, seven out of 10 mothers here do not receive antiretroviral medicines during breastfeeding to prevent infecting their babies, says the 2013 UNAIDS Progress Report. Swaziland has one of the highest HIV infection rates in the world, at 26 percent of people aged 15 to 49. A domestic worker who had to quit her job after falling pregnant, Dlamini relies on the income from her partner, a construction worker. Buying formula milk would strain the family budget. A 900-gramme tin costs 130 emangaleni (about 13 dollars) and lasts a month. Help came through a mentor mother, Jabu Mkhaliphi, who works for the NGO Mothers to Mothers. An HIV-positive mother who breastfed her three-year-old daughter, Mkhaliphi allays the fears of pregnant women. “No mother wants to infect their baby,” Mkhaliphi told IPS. She takes them through her experience and, as a result, most of her clients, like Dlamini, embrace exclusive breastfeeding despite their initial fear. Yet many women living with HIV are sceptical about breastfeeding in this impoverished southern African country. Only 17 percent of children aged four to five months are exclusively breastfed, says the most recent Demographic Health Survey. And, with a median duration of mixed breastfeeding of 17 months, there are many chances for HIV infection. Percy Chipepera, director of the Swaziland Infant Nutrition Action Network (SINAN), links this trend to the discovery, back in the 1990s, that breast milk carries the virus, when HIV positive mothers were discouraged from breastfeeding. “During this period, a lot of children died of diarrhoea and malnutrition,” said Chipepera. Some deaths could be attributed to poor hygiene when preparing the feeding bottles, leading to gastrointestinal infections, while many parents could not afford formula milk, which led to malnourishment, he explained. A glimmer of hope was restored when ART was introduced around 2005. ART lowers the mother’s viral load significantly, making breastfeeding, if done properly and exclusively, quite safe. Being at body temperature, breast milk will not damage the baby’s delicate mucosa lining up its digestive system. However, hot food can cause microscopic lesions through which the virus could enter. The good news: if the mother’s viral load is low or undetectable thanks to ART, the chances of transmission are greatly reduced. Exclusive breastfeeding – giving the baby nothing but breast milk – for six months is recommended by the United Nations Children’s Fund (UNICEF), by SINAN and by the Ministry of Health. However, exclusive breastfeeding is not that simple for many mothers. Grandmothers and aunties may believe that babies are not satisfied by breast milk alone and must be given supplementary food or ritual herbal teas. Dr. Florence Naluyinda-Kitabire, an HIV/AIDS specialist with UNICEF, attributes these practices to poor understanding of breastfeeding. Among the things that mothers should learn, said Naluyinda-Kitabire, is that babies should not be removed from one breast until they have dried it out. One common mistake is that mothers remove the infant from the one breast soon after they have finished the liquid milk, leaving the hind milk. Yet the hind milk fills up the baby because it has fat. “While HIV/AIDS is responsible for the decline in breastfeeding, other issues need to be addressed,” said Naluyinda-Kitabire. One is the misconception, not only in Swaziland, that exclusive breastfeeding is for HIV-positive mothers. Naluyinda-Kitabire stressed that all babies, irrespective of the mother’s HIV status, should be breastfed because it is good for their health. On average, exclusive breastfeeding by Swazi mothers lasts only three months, reports the 2010 Swaziland Multi-Indicator Cluster Survey. Part of the reason is that mothers must return to work after 12 weeks. The International Labour Organisation, through the Maternity Protection Convention, which Swaziland has not yet ratified, calls for a minimum maternity leave of 14 weeks and for workplace support for nursing mothers. Another deterrent is the aggressive commercial marketing of formula as a good substitute for breast milk. The government is considering a Public Health Bill to limit false claims in formula marketing, and to force manufacturers to explain, on the tin, in the local language, SiSwati, that breast is best.